The present research explored whether components of social identity, namely ingroup ties, affect, and centrality, were differentially linked to mental health and inflammatory immune responses, and whether rumination mediated those relations. Study 1 (N = 138) indicated that stronger ingroup ties were associated with fewer mental health (depressive and post-traumatic stress) symptoms; those relations were mediated by the tendency for individuals with strong ties to rely less on ruminative coping to deal with a stressful life event. 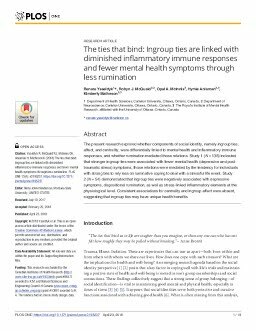 Study 2 (N = 54) demonstrated that ingroup ties were negatively associated with depressive symptoms, dispositional rumination, as well as stress-linked inflammatory elements at the physiological level. Consistent associations for centrality and ingroup affect were absent, suggesting that ingroup ties may have unique health benefits.